Within a single hour, more energy from the sun hits the Earth than all the energy utilized by humankind in one whole year. Imagine if it is possible to harness the sun’s energy in order to power energy requirements on Earth, and also imagine if this is carried out in a manner that is scalable, economical and environmentally responsible. Researchers have for a long time treated this to be one of the outstanding challenges of the 21st century. Daniel Esposito, assistant professor of chemical engineering at Columbia Engineering, has been reviewing water electrolysis, referring to the splitting of water into hydrogen (H2) fuel and oxygen (O2), as a way to transform electricity from solar photovoltaics (PVs) into hydrogen fuel that can be stored. Hydrogen is considered to be a clean fuel that is presently used for propelling rockets in NASA’s space program and is extensively expected to play a vital role in a sustainable energy future. The huge majority of today’s hydrogen is generated from natural gas via a process known as steam methane reforming that simultaneously discharges CO2, but water electrolysis employing electricity from solar PV provides a favorable route to generate H2 without any related CO2 emissions. Presently, Esposito’s team has developed a unique photovoltaic-powered electrolysis device capable of operating as a stand-alone platform floating on open water. His floating PV-electrolyzer can be assumed to be a “solar fuels rig” that has the potential to bear some similarity to deep-sea oil rigs, except for the fact that it would generate hydrogen fuel from water and sunlight instead of extracting petroleum from underneath the sea floor. The study (DOI: 10.1016/j.ijhydene.2017.11.086), “Floating Membraneless PV-Electrolyzer Based on Buoyancy-Driven Product Separation,” was published on Dec 15th, 2017, by International Journal of Hydrogen Energy. The researchers’ main innovation is the method through which they separate the O2 and H2gases generated by water electrolysis. Modern electrolyzers employ expensive membranes in order to maintain separation of these two gases. The Columbia Engineering device depends instead on a unique electrode configuration allowing the gases to be separated and then collected by employing the buoyancy of bubbles in water. The design allows effective operation with increased product purity and without the need for actively pumping the electrolyte. 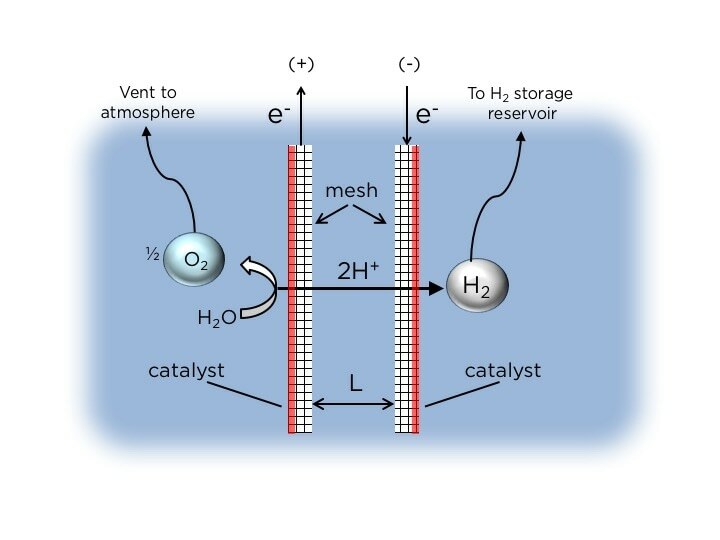 The simple electrolyzer architecture generates H2 with purity as high as 99% based on the idea of buoyancy-induced separation. “The simplicity of our PV-electrolyzer architecture—without a membrane or pumps—makes our design particularly attractive for its application to seawater electrolysis, thanks to its potential for low cost and higher durability compared to current devices that contain membranes,” says Esposito, whose Solar Fuels Engineering Laboratory produces solar and electrochemical technologies capable of transforming renewable and abundant solar energy into storable chemical fuels. We believe that our prototype is the first demonstration of a practical membraneless floating PV-electrolyzer system, and could inspire large-scale ‘solar fuels rigs’ that could generate large quantities of H2 fuel from abundant sunlight and seawater without taking up any space on land or competing with fresh water for agricultural uses. Commercial electrolyzer devices depend on a divider, or membrane, to separate the electrodes inside the device from which O2 and H2 gas are generated. The majority of research on electrolysis devices has focused on devices that integrate a membrane. These dividers and membranes need a high purity water source as they are prone to degradation and failure. Seawater comprises of microorganisms and impurities that can just destroy these membranes. Being able to safely demonstrate a device that can perform electrolysis without a membrane brings us another step closer to making seawater electrolysis possible. These solar fuels generators are essentially artificial photosynthesis systems, doing the same thing that plants do with photosynthesis, so our device may open up all kinds of opportunities to generate clean, renewable energy. Essential to the operation of Esposito’s PV-electrolyzer is an exceptional electrode configuration comprising of mesh flow-through electrodes that are coated with a catalyst just on one side. These asymmetric electrodes encourage the evolution of gaseous O2 and H2 products on just the outer surfaces of the electrodes where the catalysts have been placed. When the growing O2 and H2 bubbles become huge enough, their buoyancy leads them to detach from the electrode surfaces and then float upwards into individual overhead collection chambers. The team used the Columbia Clean Room for depositing platinum electrocatalyst onto the mesh electrodes and the 3D-printers in the Columbia Makerspace in order to produce many of the reactor components. The researchers also employed a high-speed video camera for monitoring transport of O2 and H2 bubbles between electrodes, a process called “crossover.” Crossover between electrodes is unwanted as it decreases product purity, thus resulting in safety concerns and the requirement for downstream separation units that further results in the process becoming more expensive. In order to monitor O2 and H2 crossover events, the researchers included windows in all electrolysis devices allowing them to take high-speed videos of gas bubble evolution from the electrodes while the device was working. These videos were normally taken at a rate of 500 frames per second (a typical iPhone is capable of capturing video at a rate of 30 frames per second). The team is working on enhancing their design for more effective operation in real seawater, which poses further challenges compared to the more perfect aqueous electrolytes employed in their laboratory studies. The researchers also plan to create modular designs that they will be able to use for building larger, scaled-up systems. There are many possible technological solutions to achieve a sustainable energy future, but nobody knows exactly what specific technology or combination of technologies will be the best to pursue. We are especially excited about the potential of solar fuels technologies because of the tremendous amount of solar energy that is available. Our challenge is to find scalable and economical technologies that convert sunlight into a useful form of energy that can also be stored for times when the sun is not shining.